Originating in France, “outdoor parks in harmony with nature”. In 1997 Altus built a treetop course in France, initially just for corporate training, but it soon proved so popular that it was opened to the general public. It was so successful that the idea was exported abroad, and now similar courses can be found all over the world. The French name (La foret de l’aventure) was difficult for Japanese speakers to pronounce, so the English version was adopted in Japan – Forest Adventure. 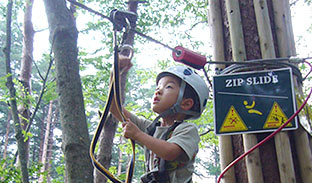 Pacific Network, in partnership with Altus, constructs these treetop courses throughout Japan. At Forest Adventure, our first rule is that you are responsible for your safety while you do the course, and this applies to adults and children alike. In the trees you will be in control of your own safety equipment, making sure you are properly attached as you move around the course. This is one of our most attractive features, as it puts you in charge, and it means the experience is serious as well as fun. Adults can have fun like kids, and kids can feel responsible like adults. Using the forest in its natural state. 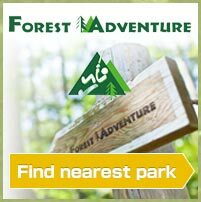 “The best thing about Forest Adventure is that it uses the natural forest. Therefore, unlike the construction of a typical amusement park, it does not have a large impact on the environment, and the damage is minimal. On 7th August 2006, we opened the first Forest Adventure Park, at 1100m altitude in the shadow of Mt. Fuji. The park, which enjoys close-up views of the iconic mountain from the treetops, is built in 15ha of forest owned by Yamanashi prefecture. Part of the park’s revenue always goes towards maintaining a healthy forest, and because of this business model in 2005-6 the Forestry Agency supported the park with a forest management grant. European safety standards, and accumulated safety management expertise. Because Japan lacks safety regulations for this type of course, Forest Adventure holds itself to European safety standards. From the experience of operating treetop courses since 2006, Forest Adventure has built up the expertise to run courses that are both safe and fun. We constantly aim for greater safety.